Celebrate the release of our latest issue, meet friends, shop local, color and craft, get swag and discounts! Grab your friends and come party with us Saturday, February 24th, 11–2 PM at Morningtide, our favorite little shop in Albany to celebrate the release of the oh-so-beautiful Issue #6: The Symbols Issue!! There will be CD Mandala crafting, an exclusive DIY project from Issue #6, as well as a big coloring table for all you drawing wizards. Come ready to snack because Good Eggs, the absurdly fresh grocery delivery service, will be providing delightful treats! 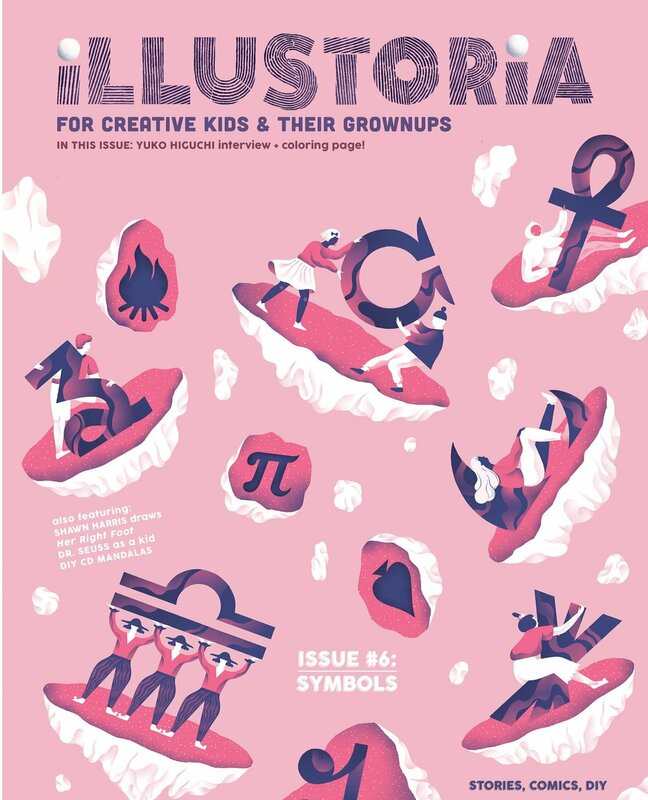 And if tasty snacks weren't enough to solidify your Saturday plans, our amazing sponsor Sakura will be giving out free pen/marker set for every ILLUSTORIA magazine purchase. Issue #6: The Symbols Issue Cover Art by Marina Munn. There could be no better place to share The Symbols Issue with you than Morningtide. This exquisitely curated boutique shop was founded by friends Lisa Fontaine and Lisa Wong Jackson, who share a love for objects that bring happiness and offer a sense of well-being. We hope you can join us to craft, snack, and most of all get inspired by all of the amazing content to be found in Issue #6. Get your hands on our interview with the brilliant cult artist Yuko Higuchi, an exclusive look at the making of Her Right Foot written by Dave Eggers and illustrated by Shawn Harris, a stunning comic by cover artist Marina Munn, the latest edition of Literary Giants as Kids featuring Dr.Seuss by Elizabeth Haidle, and so much more. See you there!